Just for a change from Sudoku, I thought I’d upload a different type of puzzle today (I might also add a Sudoku variant later, if I have time!). 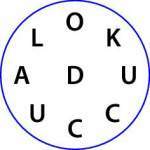 This is a more traditional type of puzzle – a word wheel. The idea is to form as many words as you can by using a selection of letters from the wheel no more than once each per word – and every word must include the centre letter. Words must be 3 letters or longer, and be a regular English word. For example in the wheel here we could form “LAD” as one of our words.